I recently took a lean mean shopping machine trip to Waitrose. I had a £20 off if you spend £120 coupon and I had a £100 Waitrose voucher I’d bought for £95 through PerkBox. I was ready to shop and save! When I got there Waitrose were offering 25% off wines and spirits if you bought six or more bottles. Happy days! I did buy groceries first. I had a list and I shopped to it, ensuring we’d have actual nutrients to get us through the week, before hitting the wine aisle. [End of public service announcement]. I picked up a few wines and a bottle of gin. 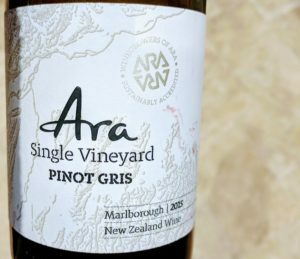 This Ara Single Vineyard Pinot Gris was one of the wines. It wasn’t one of the more expensive ones, nor was it the cheapo risotto wine I threw in to make it up to six and save much more than that wine cost. It was in the Goldilocks price range. It was a bright golden yellow and smelt of honey, a floral honey, none of your mass produced stuff or that weird bear honey which to English tastebuds tastes nothing like honey at all, no this smelled like the kind of honey even Winnie the Pooh would approve of. Whilst dry, that honey smell gave it a sweet taste. It was joined by peaches, fresh, ripe, juicy peaches eaten in a meadow full of flowers. OK, so that may be over-romanticising just a little bit, but there’s a delicate, non specific floral character, as well as a bright splash of citrus juice. It’s in the medium alcohol range. I don’t normally look to New Zealand for Pinot Gris (or Pinot Grigio for that matter) in the New Zealand aisle, but as I was going shopping crazy this caught my eye. I’d certainly look again for Alsace style wines from this producer and from Marlborough, as exchange rates do their thing and prices fluctuate. At £9 I thought it was reasonable value. With an extra 25% off it was a bargain.